The Vysoko-Petrovsky MonasteryRussian: Vysoko-Petrovskiy monastyr or Высоко-Петровский монастырь is one of the oldest monasteries in Moscow. It dates back to the 14th century, when the fist wooden church was built here. 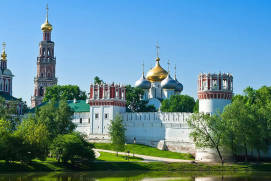 It gained most of its momentum at the end of the 17th century, when its patrons were the Naryshkins and Tsar Peter the Greatruled from 1682 until 1725 himself, whose mother belonged to this aristocratic family. 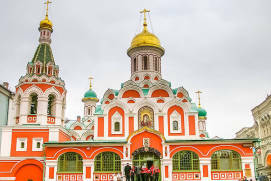 The architecture of the monastery is remarkable, as it blends medieval Russian church building traditions with exquisite elements of the baroque stylein Russia called Naryshkin Baroque . 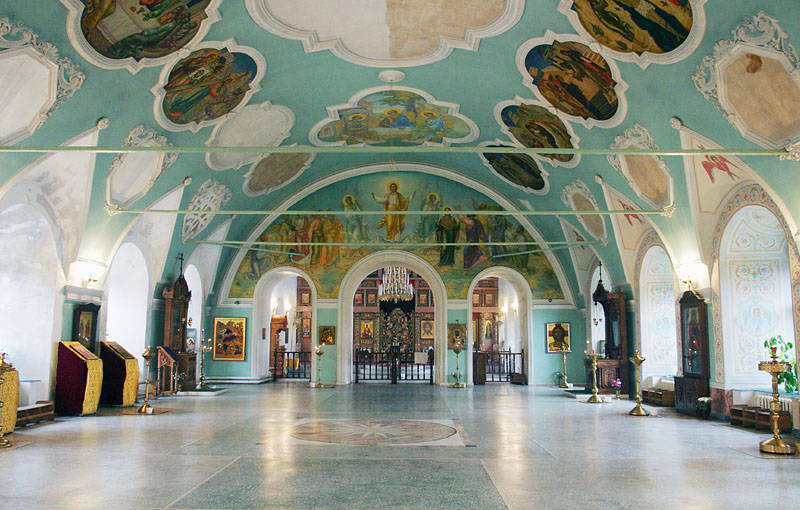 The activity of the cloister, suspended in Soviet times, resumed in the 1990s. 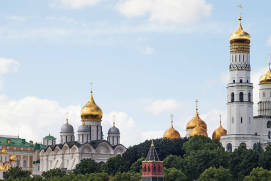 Today, this is an active stavropegic monastery situated in the centre of Moscow, attracting both tourists and pilgrims. 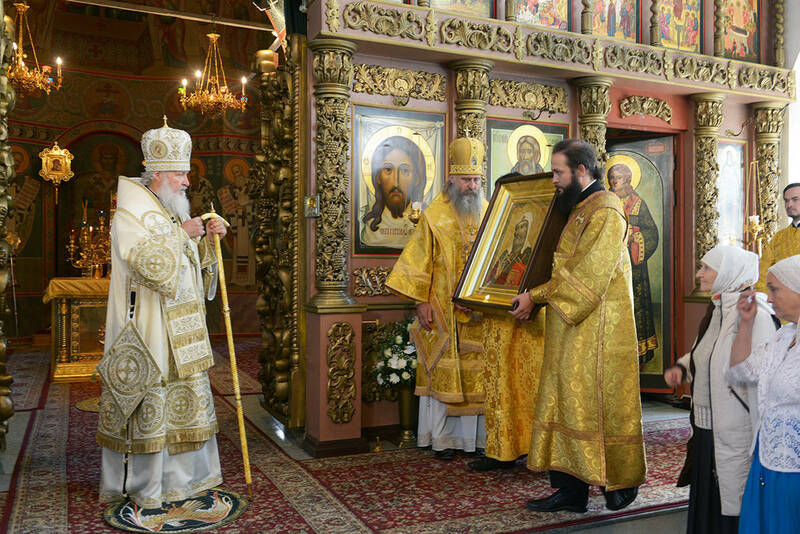 Among the relics of the monastery are a reliquary with a particle of Metropolitan Peterthe Russian metropolitan who moved his see from Vladimir to Moscow in 1325’s relics, particles of relics of Apostles Peter and Paul, Seraphim of Sarovone of the most renowned Russian saints in the Eastern Orthodox Church, Sergy Radonezhskya spiritual leader and monastic reformer of medieval Russia, Kievo-Pecherskyfrom one of the first founding monasteries of Kievan Rus'’s fathers, and others. 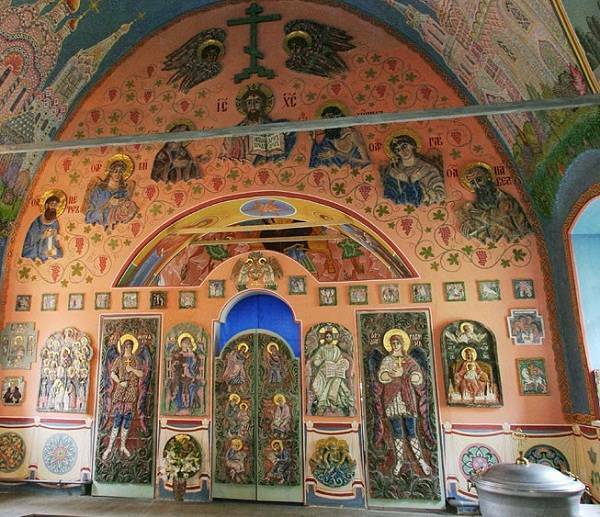 Legend has it that this monastery was established by Metropolitan Peter in 1315-1326. 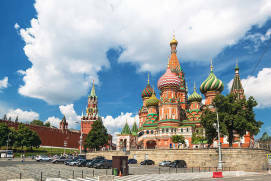 There is another version of the tale, however, which claims that its founder was Moscow Prince Ivan KalitaGrand Duke of Moscow from 1325 and Vladimir from 1332. 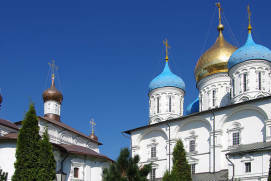 Yet another legend has it that the monastery was founded by Dmitry Donskoythe first prince of Moscow to openly challenge Mongol authority in Russia – when coming back home after the battle at Kulikovo FieldRussian: Kulikovskaya bitva or Куликовская битва in 1380, he resumed the activity of the existing cloister. 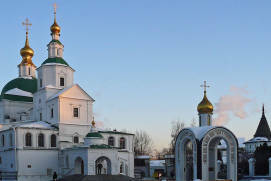 In any case, in the early 14th century, a wooden cathedral in honour of saints Peter and Paul was built on this site near the northbound road from Moscow. A monastery developed from these foundations over time. 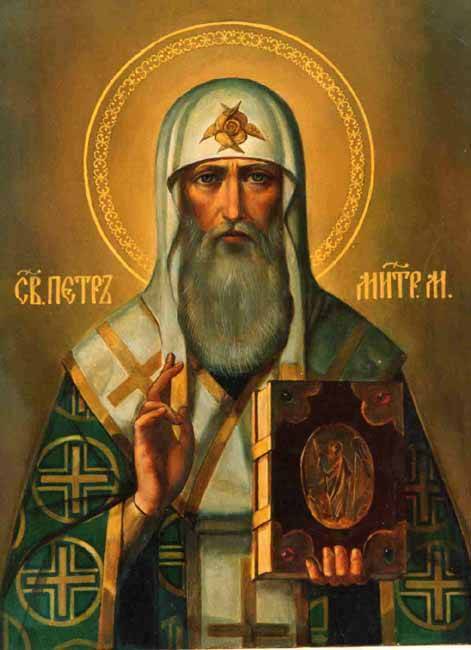 Metropolitan Peter is a significant figure in the history of the Grand Principality of Moscow as a whole. 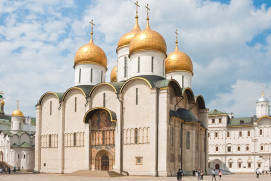 He laid the foundations of the first Assumption CathedralRussian: Uspenskiy sobor or Успенский собор in the Kremlin in 1326, and also moved the metropolitan’s seat from Vladimira city located on the Klyazma River, 200 kilometers to the east of Moscow to Moscow, thus turning the city into a religious centre of the developing Principality. 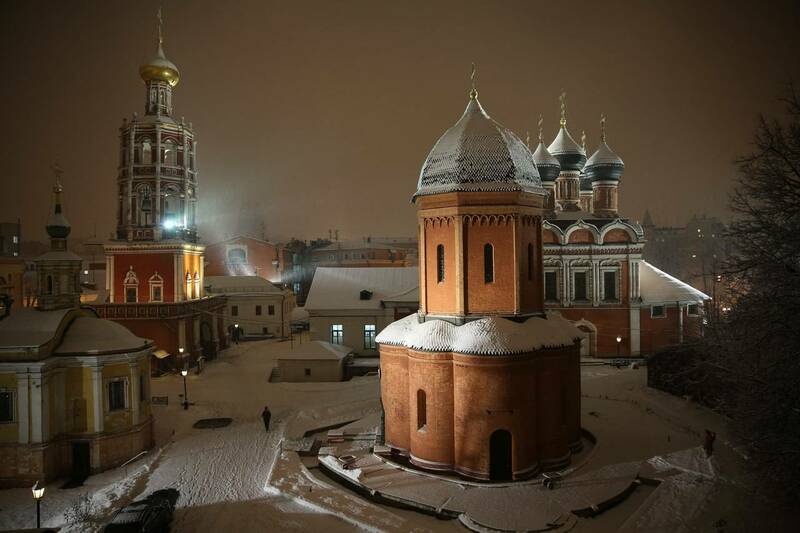 After his death, Metropolitan Peter was sainted and the monastery cathedral was reconsecrated to Petrovsky to honour the revered saint. 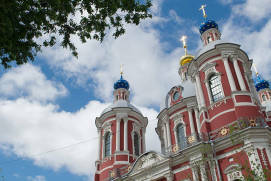 Located on a hill, the monastery has been named Vysoko-Petrovsky since then. 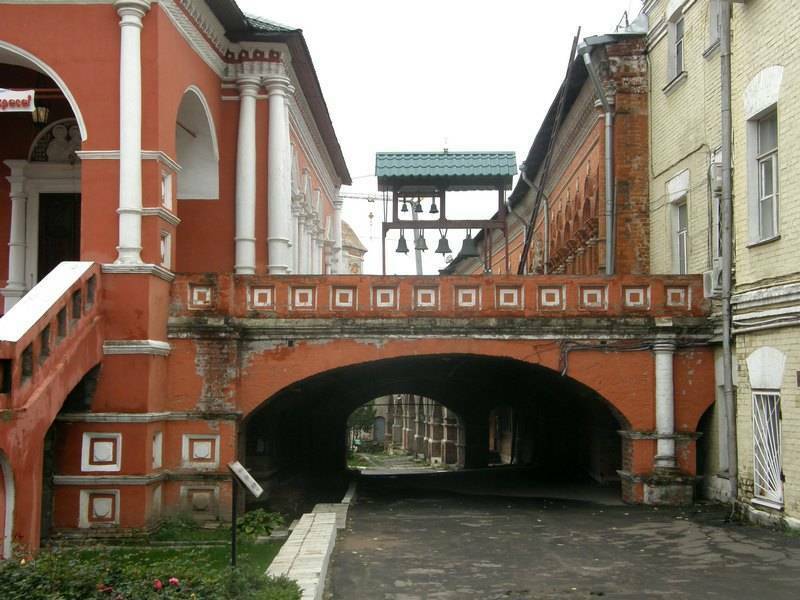 It is interesting that the monastery gave name to numerous streets around it, such as: PetrovkaRussian: Петровка, Petrovsky liniiRussian: Петровские линии, and Petrovsky boulevardRussian: Петровский бульвар. 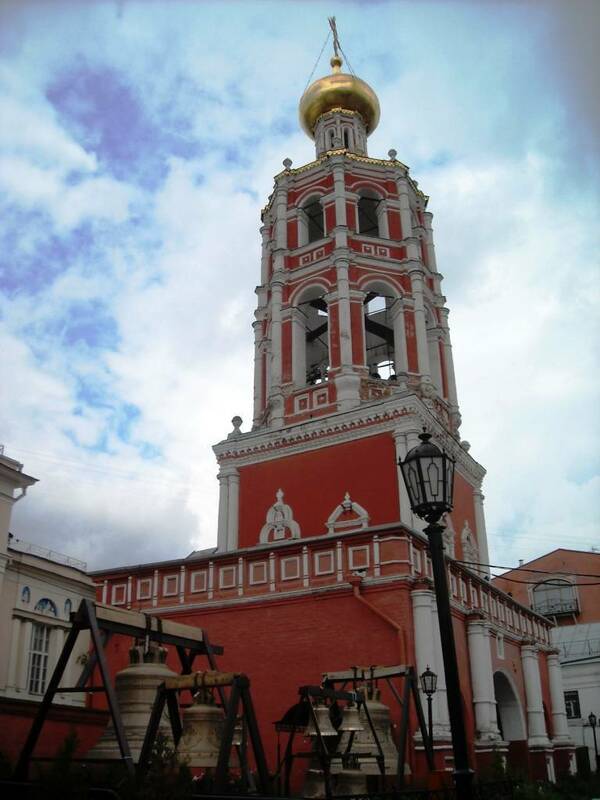 Under Prince Vasily IIIthe Grand Prince of Moscow from 1505 to 1533, the Petrovsky Cathedral was rebuilt in stone. 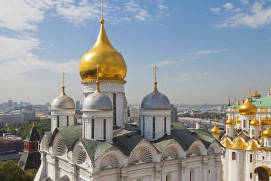 It was designed by famous Italian architect Aloision the New, who created the Archangel CathedralRussian: Arkhangelskiy sobor or Архангельский собор in the Kremlin. 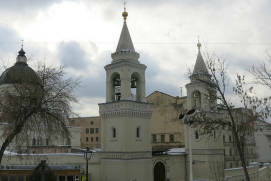 The Metropolitan Peter (Petrovsky) CathedralRussian: Khram Petra Mitropolita or Храм Петра Митрополита is octophyllous in its layout, a unique shape for the 1510s. 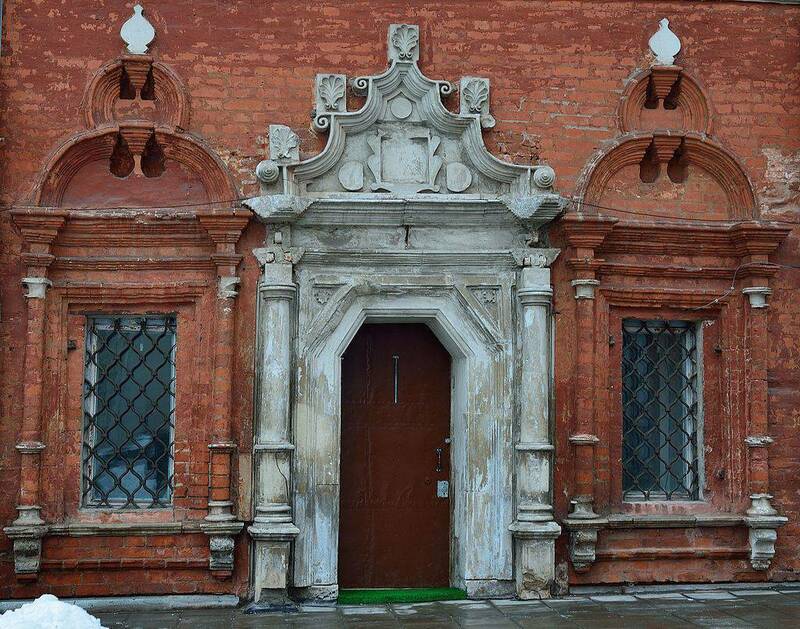 From that period, this style started spreading throughout Old Rus and was known as the “Naryshkin Baroquea particular style of Baroque architecture and decoration that was fashionable in Moscow from the turn of the 17th into the early 18th centuries” style. The rise of the monastery is also linked to the Naryshkin family at the turn of the 17th – 18th centuries. 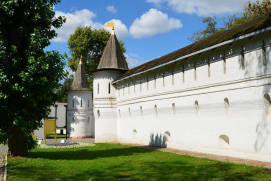 In 1671, Peter the Great’ uncle Kirill Naryshkin gave his son-in-law Tsar Alexei Mikhailovichthe tsar of Russia from 1645 until his death in 1676 an estate adjacent to the monastery. 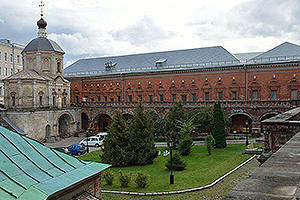 The tsar then donated the estate to the cloister, nearly doubling the territory of the monastery. 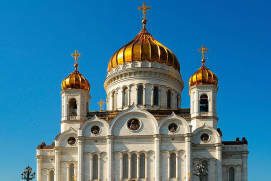 A little while later, several cathedrals were built under the auspices of Peter the Great. 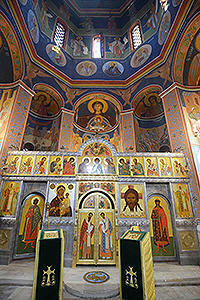 he first of these cathedrals – the Bogolubovo Icon CathedralRussian: sobor Bogolyubskoy ikony Bozhey materi or собор Боголюбской иконы Божией матери (1684 ‒ 1685) – became the family burial vault of the Naryshkins. 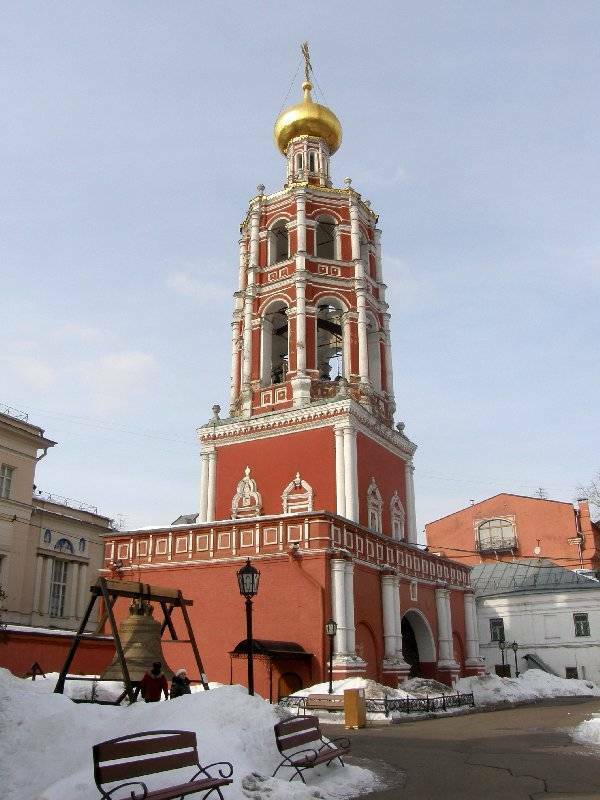 The cathedral was built on the site where Ivan and Afanasij Naryshkin were killed during the Streletsky Uprisingan uprising of the Moscow Streltsy regiments who were the units of Russian guardsmen from the 16th to the early 18th centuries, armed with firearms in 1782. More than 20 members of the famous family were buried in the church in total. The Sergius of Radonezh ChurchRussian: tserkov Sergiya Radonezhskogo or церковь Сергия Радонежского with its adjoining refectory and brethren’s cells was erected at the turn of the 17th – 18th centuries. 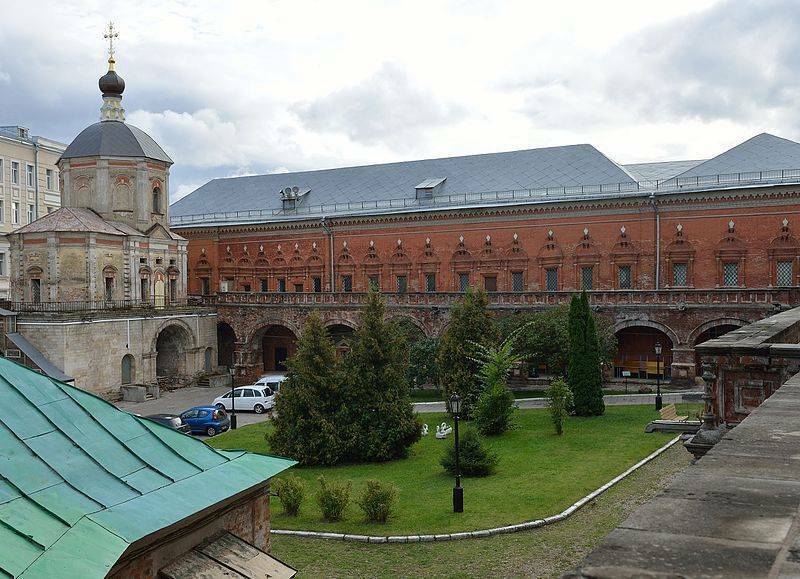 The church divided the territory of the monastery into two courtyards; the front courtyard which contains the Metropolitan Peter (Petrovsky) CathedralRussian: khram Petra Mitropolita or храм Петра Митрополита and the back courtyard. 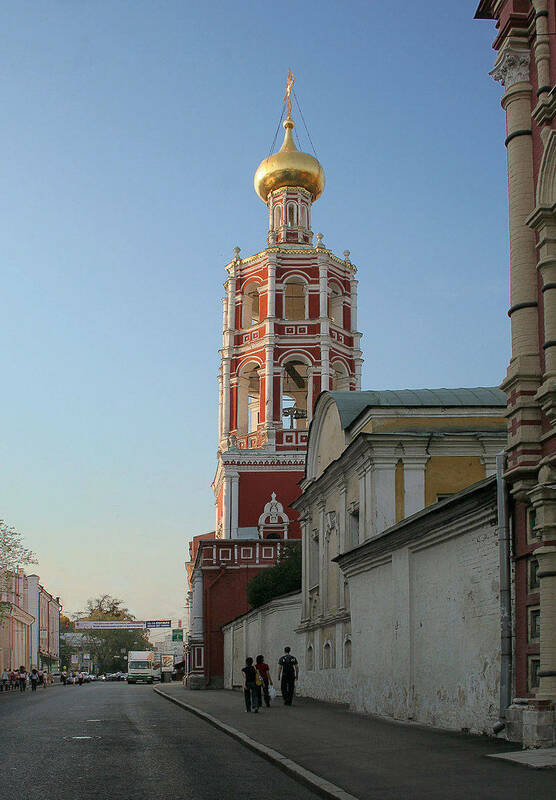 Just like the Bogolubsky Cathedral, this church demonstrates classical period shapes traditionally used in church building. 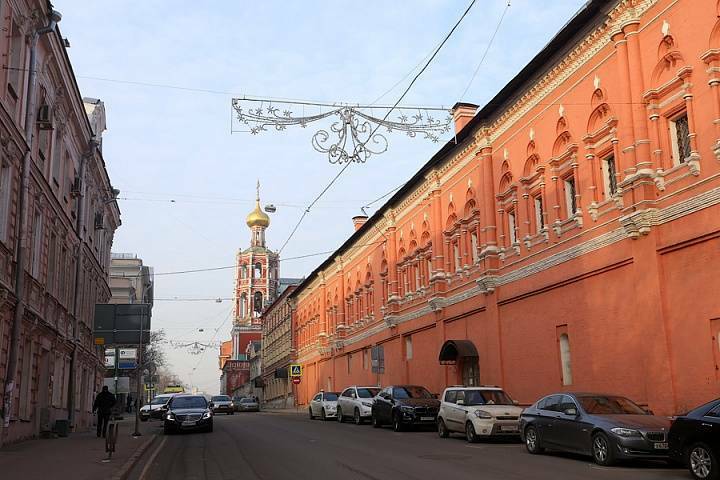 However, the combination of red brick walls and white décor exemplifies the gradual formation of the Moscow Baroque style. 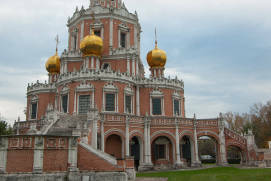 The monastery as a whole contains many other interesting monuments. 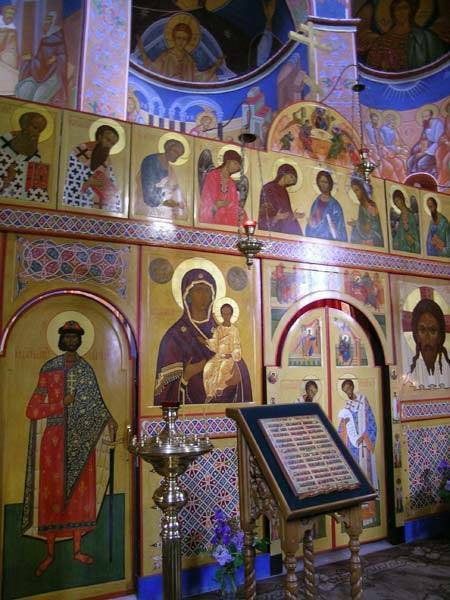 Among these are the Holy GatesRussian: Svyatye vrata or Святые врата with a gate church and a chapel, as well as 18th century churches (the Church of the Theotokos of Tolga and the Right Reverend Pakhomy ChurchRussian: tserkov prep. Pakhomiya or церковь преп. Пахомия). 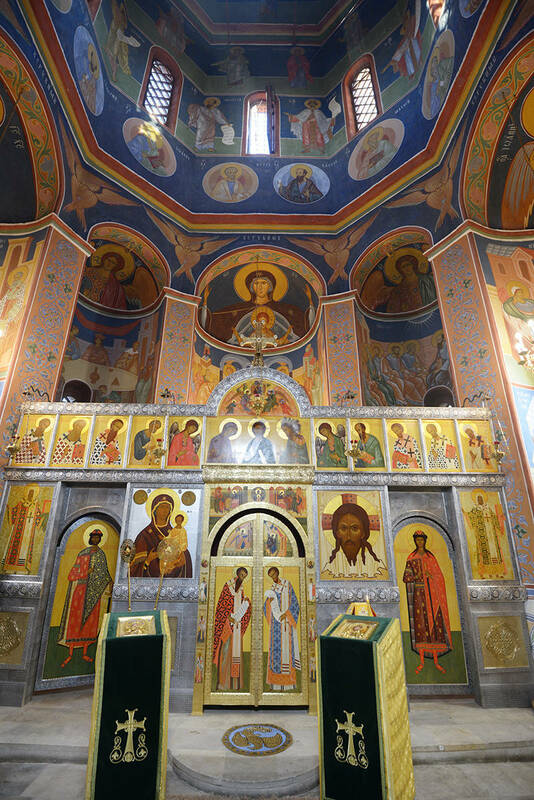 The painted iconostasis in the Church of Theotokos of TolgaRussian: tserkov Tolgskoy ikony Bozhey materi or церковь Толгской иконы Божией матери is particularly interesting. The year 1812 became a tragic page in the chronicles of the monastery. 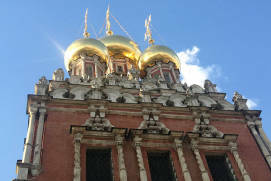 Having captured Moscow, Napoleon’s troops did not spare this beautiful construction; interestingly, the French cavalry took up residence there. 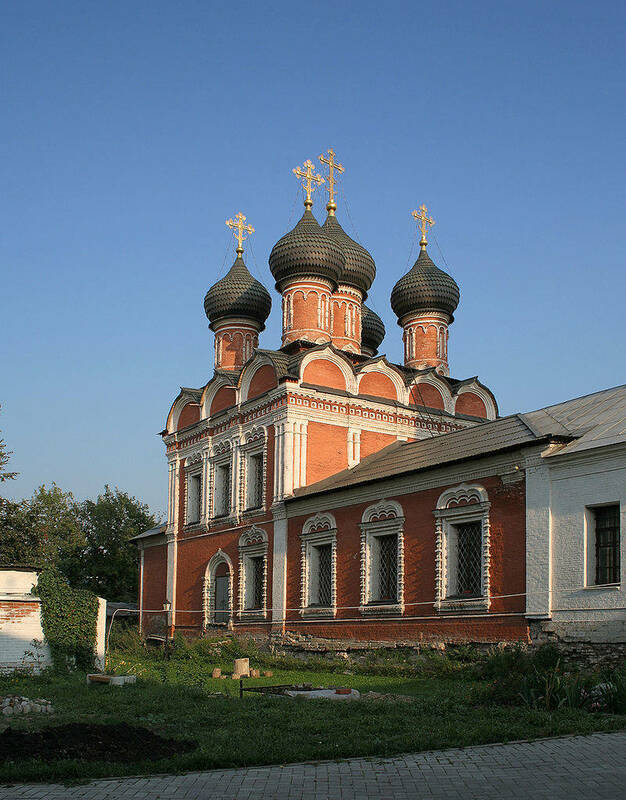 They did not merely live there, however – they plundered and devastated the monastery, including the Naryshkins’ tombstones. 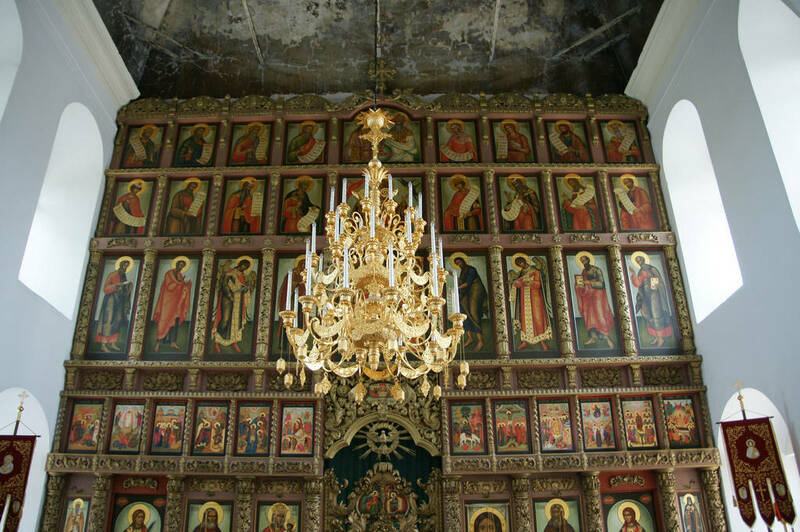 The Bogolubsky cathedral was, if possible, treated worse – the invaders drove hooks into the iconostasis, from which they hung their meat carcasses. 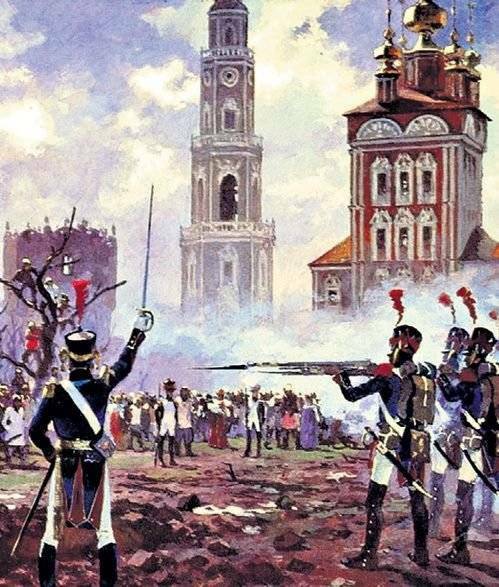 By the order of Marshal Mortier, the Muskovites who were accused of setting the city on fire were executed by a firing squad by the walls of the cloister. They were buried right on the monastery premises, near the belfry. 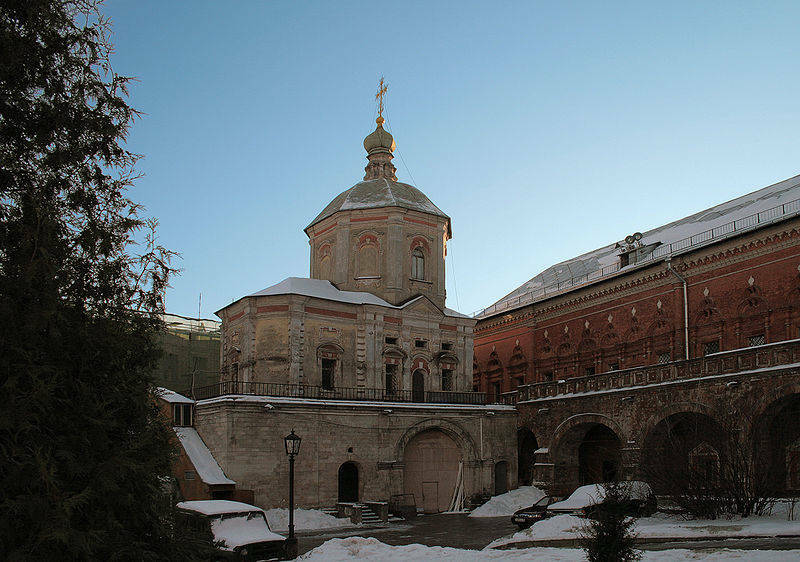 Restoration of the monastery took a long time, but gradually, it started playing a key role in the religious life of Moscow. St. Peter’s Fathers Superior’s activity has traditionally been connected with education. 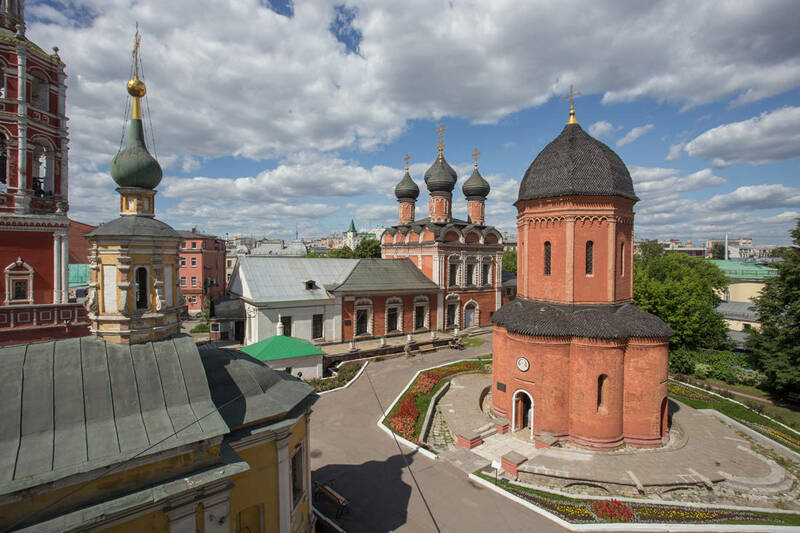 For this reason, the transfer of the Main Moscow School of Theology to the Vysoko-Petrovsky Monastery (1822) made perfect sense. 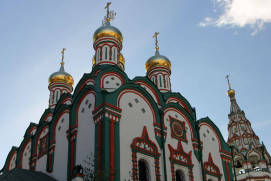 The collection of the Moscow eparchial libraryRussian: Moskovskaya eparkhialnaya biblioteka or Московская епархиальная библиотека was also kept here. Since 1863, with Archbishop Philaret’s blessing, meetings of the Society of Devotees of Religious EducationRussian: Obschestvo lubiteley dukhovnogo prosvescheniya or Общество любителей духовного просвещения have been held here. 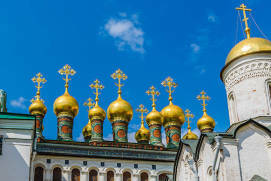 A complicated period in the history of the monastery started when the Bolsheviksmembers of a wing of the Russian Social-Democratic Workers’ Party, which, led by Lenin, seized control of the government in Russia (October 1917) and became the dominant political power came to power. In 1918, the monastery was closed down. 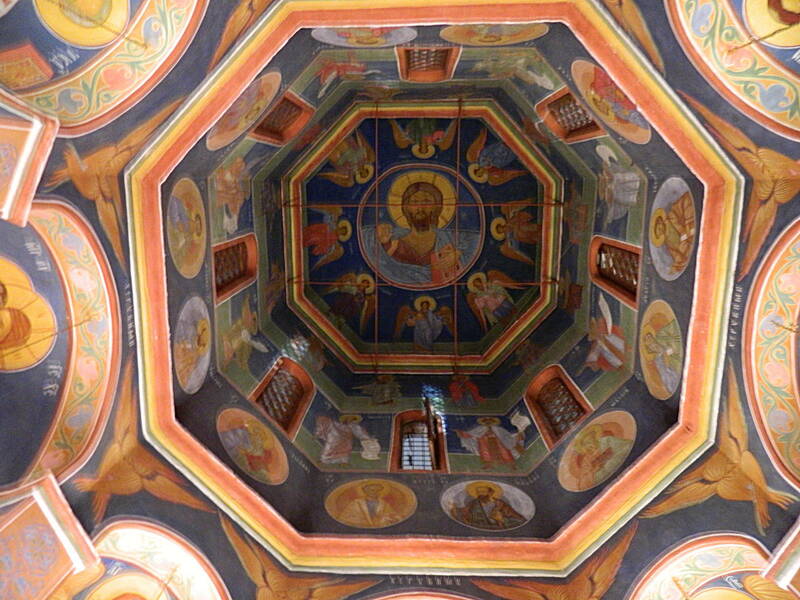 Despite this, one of the largest clandestine monastic communities emerged here. 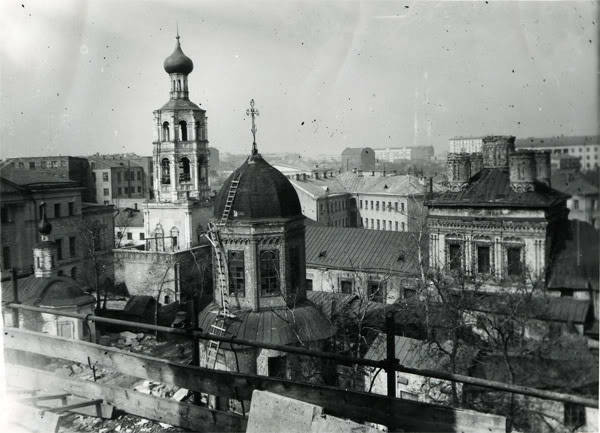 It existed until 1929, when Bogolubsky cathedral was the last to be closed down. Many monks and parishioners were executed by firing squad. 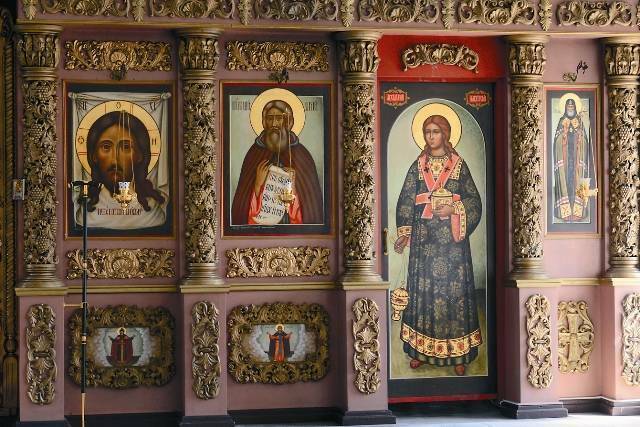 Now, those who were executed are consecrated saints. 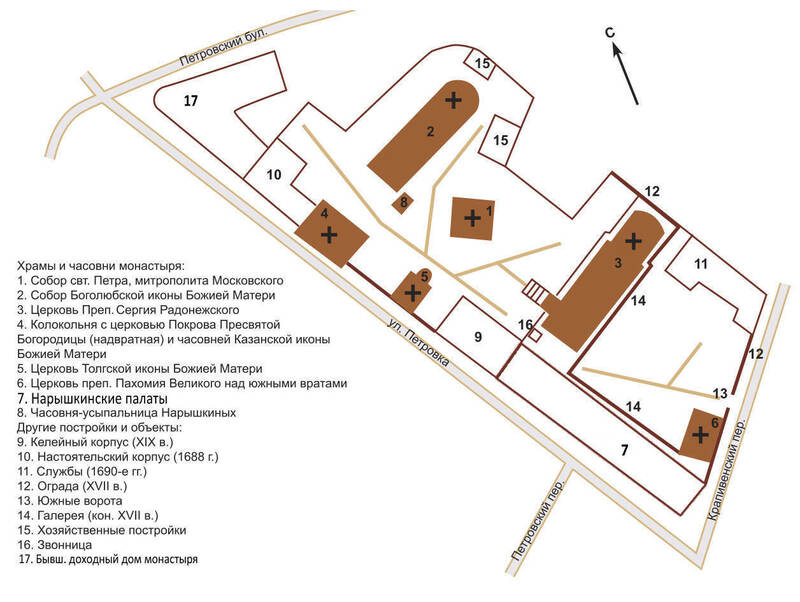 In the Soviet times, the buildings of the monastery were used as communal (shared) apartments, an agricultural machinery repairing plant, a library, a gym, a foundry, and a kindergarten. Sadly, Naryshkins’ tombstones were destroyed. In 1959, the monastery received the status of a monument of architectural heritage, which saved it from complete destruction. 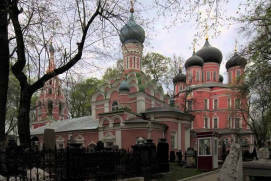 According to a city development plan of the capital, Vysoko-Petrovsky Monastery was meant to be demolished to widen a road. Production facilities and communal flats were taken away from the cloister. 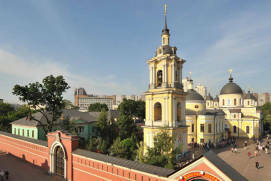 Instead, a venue for rehearsals (in St. Sergius’ churchRussian: Sergiev khram or Сергиев храм), a branch of the State Literary MuseumRussian: filial Gosudarstvennogo literaturnogo muzeya or филиал Государственного литературного музея (the Brethren’ living quarters), the Monument Preservation SocietyRussian: Obschestvo okhrany pamyatnikov or Общество охраны памятников, RosizopropagandaRussian: Росизопропаганда, and theatre workshops were housed there. 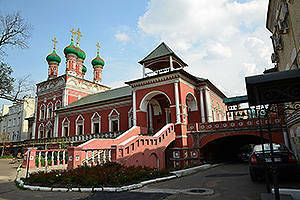 In 1992, the entirety of the Vysoko-Petrovsky Monastery was returned to the Russian Orthodox Church. After a long period of restoration, the monastery became active again. 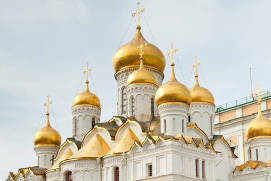 If the Russian history is a subject of your interest and you want to know, for example, what is the oldest church in Moscow, what are the famous monasteries around Moscow, which style of Moscow architecture you can see only in this town, you can read on our website pages about the Kremlin Palace and “History and Architecture”. 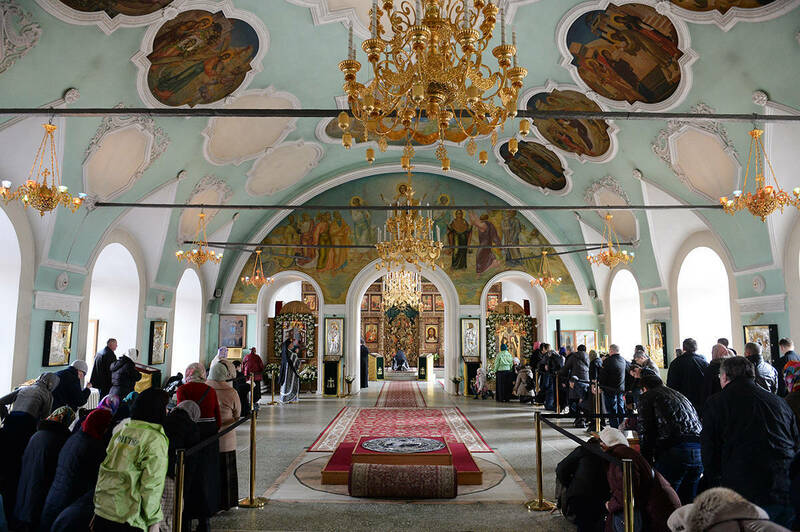 By the early 20th century the Vysoko-Petrovsky Monastery was keeping three Gospels of the 17th century, stones of the Holy Sepulcher, silver crosses with particles of the Holy Cross and other religious treasures. After the revolution, all these relics were stolen. At present, the cloister even boasts new relics. 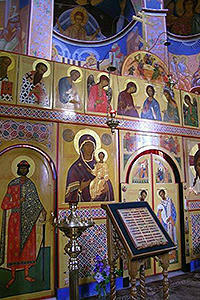 The main one is a reliquary with a particle of St. Peter, Kievan, Moscow and all Old-Rus Metropolitan’s relics. 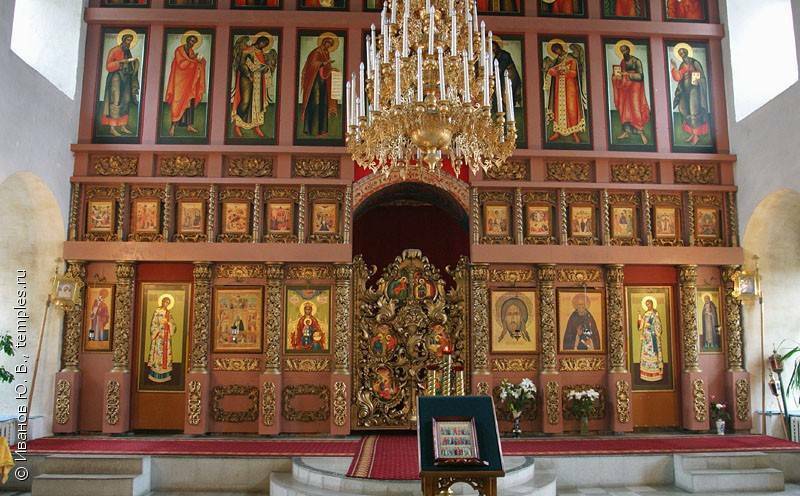 In 2010, His Holiness Patriarch Kirill of Moscow and All Russia donated these to the monastery. 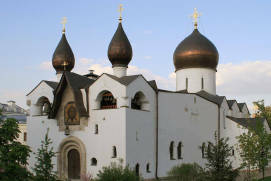 At present, services are held and excursions are offered to visitors to the monastery. 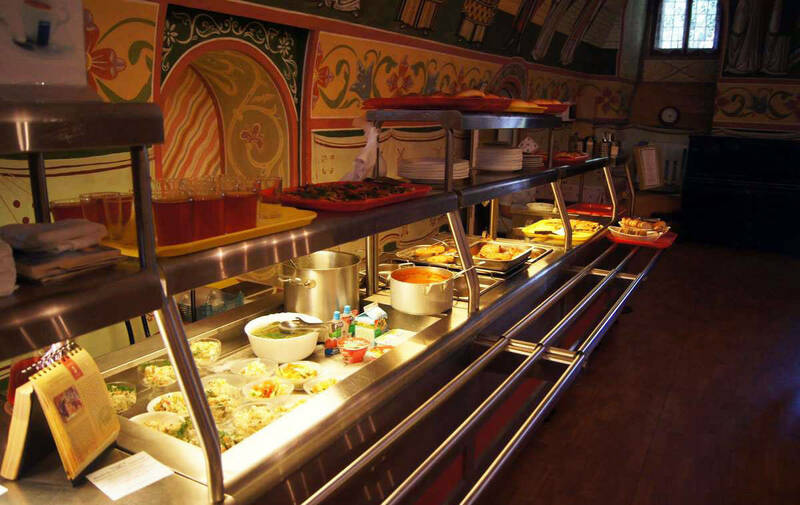 In the refectory, you can sample local monastic food. 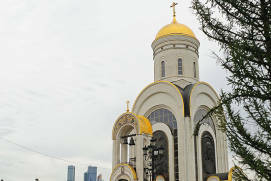 The Vysoko-Petrovsky Monastery is conveniently located within the Boulevard RingRussian: Bulvarnoye koltso or Бульварное кольцо, so it is easy to get to. 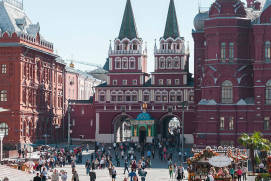 It is very pleasant to walk around the area, for example, you can walk to the Kremlin or along the boulevards. According to the schedule of the services. 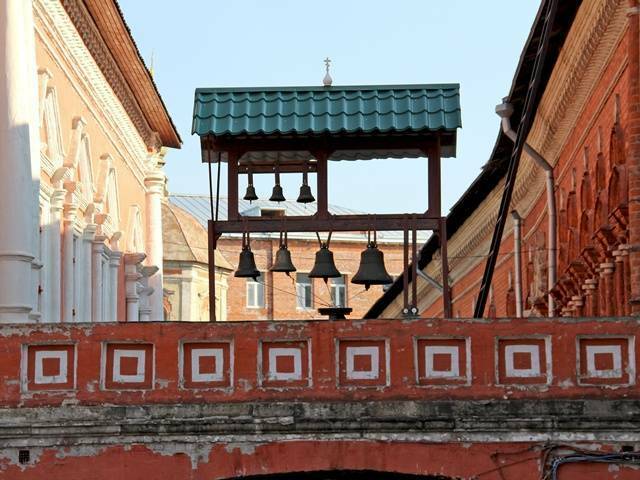 Photo and video are allowed on the territory of the monastery. There is an opportunity to take a guided tour.